16 November 2010, at 10:34a.m. AUSTRALIA - After a long period of study and preparation, Grimaud Freres Selection is pleased to announce the placement of the Grand-Parent Stock STAR 53 ducks in Pepe’s Ducks operation, located close to Sydney in Australia. [L-R] Peter Bonaccordo, Breeder Manager of Pepe’s Ducks Pty Ltd; Yann Le Pottier of Grimaud Freres Selection; Pepe Bonaccordo, Owner of Pepe’s Ducks Pty Ltd; John Houston, GM of Pepe’s Ducks Pty Ltd; David Fox, CFO of Pepe’s Ducks Pty Ltd; Mario Bonaccordo, Operations Manager of Pepe’s Ducks Pty Ltd.
Any live animal producer and exporter knows how difficult it is to supply its animals to the Australian market, and it requires a very serious and complete sanitary control within the whole company, on the farms of origin and in production methods, to be able to fulfill the Australian sanitary requirements. It requires also a motivated, industrial and well organized importer and client to be able to import any bird or animal into Australia. This is what Pepe’s Ducks Pty Ltd in Australia and Grimaud Freres Selection in France have been able to achieve in October 2010. 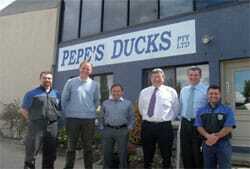 Both companies have a long business relationship, with a first placement of STAR ducks from France in 2003 to Pepe’s Ducks Pty Ltd. This new GP placement is a confirmation of the long term cooperation developed between the two companies, which has also led Pepe’s Ducks to a successful development of production and distribution of Grimaud duck in the Australian duck market within the last 7 years. For Grimaud Freres Selection, this breeder duck placement confirms the presence and the availability of its breeds in all continents where ducks are produced. For Pepe’s Ducks Pty Ltd, this new GP STAR duck placement gives the security of access and utilization of the performance of Grimaud duck genetics for the coming years and the best conditions for continuous economical development of their duck meat production activity.